Milestones are coming in thick and fast for Reliance Industries and its founders. 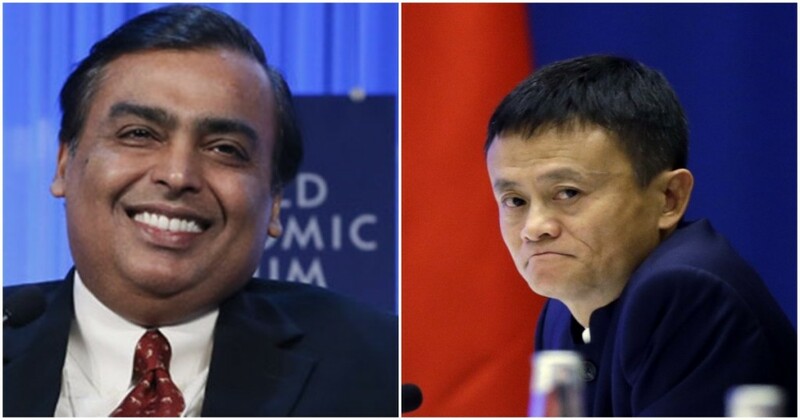 A day after Reliance became only the second Indian company to reach the $100 billion club, Chairman Mukesh Ambani has toppled Alibaba’s Jack Ma to become Asia’s richest man. Ambani now has a net worth of $44.3 billion (Rs. 3.03 lakh crore). Ma, until now the richest man in Asia, is now valued at $44 billion, $300 million less than Ambani. Ambani’s soaring net worth is thanks largely to the stupendous run that Reliance Industries stock has enjoyed over the last week. At the beginning of trade on Monday, RIL traded at Rs. 991. Today, it closed at Rs. 1,101, a 11% gain over the period. Ambani, who owns roughly 46% of Reliance Industries, saw his net worth jump by the same amount, and leapfrogged past Ma, who’s seen his net worth fall by $1.4 billion this year. This run in Reliance’s stock is in sharp contrast to how its stock has performed over the last decade. In January 2008, Reliance’s stock traded at Rs. 781, and this Monday, it traded at Rs. 991, which represents only a 2.4% annual return over the period. 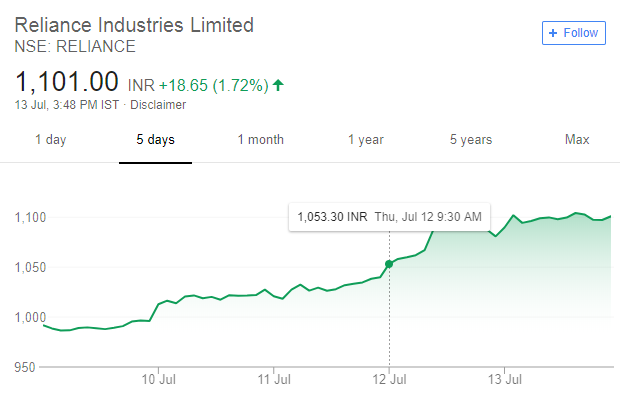 But Reliance’s stock has appeared to grow fresh legs, spiking 10% this week. Reliance’s investors seem to be clearly impressed with the moves the company has made in the recent past. In its latest AGM, Ambani spend a majority of his time talking about Reliance’s digital initiatives, including its Jio telecom business, its range of feature phones, and JioGigaFiber, its brand new broadband service. Reliance also announced that it would soon enter the smart home segment as well, with digitally connected devices such as security systems and smoke sensors. And there have been rumblings about its entry into India’s e-commerce market through an offline-to-online model. And while Reliance still retains its focus on petrochecmicals — it operates the world’s largest refinery in Jamnagar — it’s shown that it’s willing to not only embrace, but also lead digital initiatives. And it’s already shown itself to be successful at them — Jio has not only captured a large section of India’s telecom users, but also managed to be profitable while doing so. Ambani is reinventing Reliance from being a company that made polymers and oil into a global conglomerate that has interests in everything from television channels to retail. And as the head of the sprawling conglomerate that is Reliance industries, he’s being richly rewarded for his efforts. Ambani is already the richest man in Asia with a net worth of $44.3 billion; if Reliance can fulfill the promises of its recent digital initiatives, there might soon be other milestones around the corner.